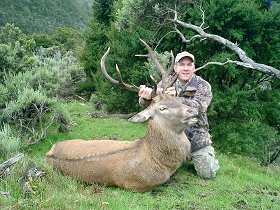 The major game animals available for hunting in New Zealand are deer (red stag, fallow, wapiti, sika, white-tail, sambar, and rusa), chamois, himalayan bull tahr, and pig--all introduced by settlers. In fact, New Zealand had no land mammals--except for bats--before European settlers arrived. Deer are not native to New Zealand, and in fact were introduced in the wild in the 1850's and 1860's from England or via Australia, and in the case of wapiti, from America--by US President Teddy Roosevelt. Today, deer exist both in the wild and on farms. Unlike in their countries of origin, the deer in New Zealand have no natural predators, and thus populations have grown dramatically, causing problems for a number of kinds of indigenous plants. Deer population was brought under control by culling and commercial harvesting, is controlled today mostly by hunting. Himalayan bull Tahr were introduced by early European settlers, who brought animals from the central Himalayan ranges of India and Nepal, and today are found in alpine grassland zones South of the Rakaia River in the southern alps. Pigs were brought to New Zealand by a French explorer in 1769, and then by Captain Cook, who gave pigs as gifts to the Maoris in the 1770's. The pig population was flourishing by the middle 1800's, and were the first non-native species to be hunted for sport in New Zealand. The New Zealand Department of Conservation has a very good website with information on these and other animals. Most hunting packages will offer the option of complimentary small game (possum, rabbits and hares) hunts as well. Fly-fishing is also very popular in New Zealand. If you'd like to combine your hunting trip with fly-fishing, we offer a number of New Zealand fly-fishing packages as options as well. Te Ara, the Encyclopedia of New Zealand, has an excellent section on their website regarding imported game animals. about booking your New Zealand hunting trip.